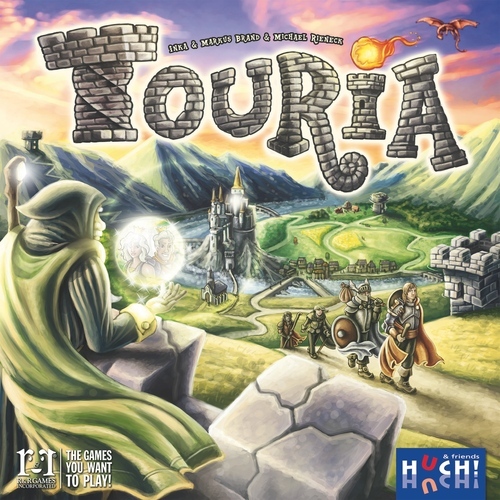 Touria* is a family board game for two to four players that plays in around an hour. The box suggests ages 10+, but I’d suggest it will go quite a bit younger than that played in the right spirit (see below). 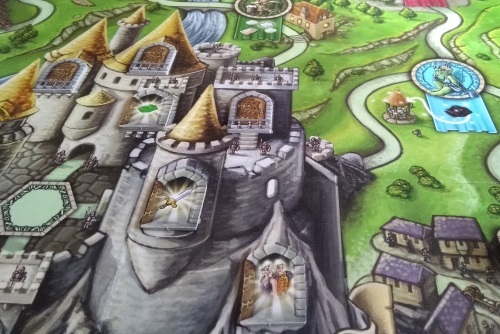 The game has a generic fantasy setting but no complaints: the theme is light but appropriate and the rulebook does well in telling the story of this magical kingdom – aiming itself firmly at the younger market. On your turns, players will move a single piece (the adventuring heroes) around the board, doing various actions to collect gems, money, swords and hearts (thematically, the last is more winning affection for completing heroic deeds). 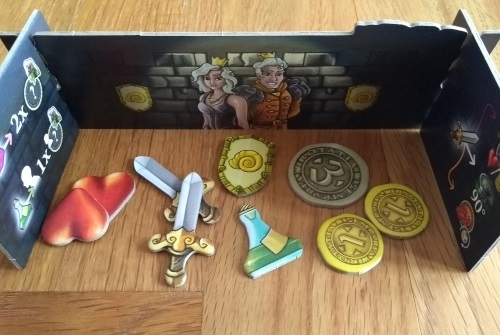 But this is not a co-operative game – players are competing to be the first to win the heart of the prince (or princess) and return to the castle to win. Experienced gamers will immediately recognise the art of Klemens Franz throughout the game – he of Uwe Rosenberg (Agricola, Le Havre etc), Suburbia and Orleans fame. His whimsical, cartoony style works perfectly here and is well backed by high quality, chunky cardboard components – solid value for the £30 price tag you should be able to find it for (you may have to shop around). Touria is a simple game to teach, while the available actions are visible to all players throughout the game so it’s easy to go over things as you progress. There are some hidden items kept behind your screen, but these are generic so can be discussed openly (it’s more the amount, or colour, of each that you want to keep a secret). At the centre of the game lies its clever action selection mechanism. In the corners of the board are four square towers, each of which has four actions depicted on the top – one on each face of the square (think standard compass points). Players must sit on different sides of the table, so each player has four of these actions facing towards them – so if you are sitting on the east side of the board, the four east-facing tower sides are your available choice of actions. Players take it in turns to play an action. Once done you turn the tower you used 90 degrees, so affecting the actions available to the other players. There are eight different actions, each on two separate towers, so it is possible to have as few as two different actions available to you on your go if you are unlucky – or if the other players think you want to do something specific and make sure you can’t! To take an action, you must move the group of heroes to the appropriate space on the board. You can move up to three spaces for ‘free’, with each extra space costing you a coin – sometimes problematic, as you need a certain number of coins in hand to win the game. You also pick up gems as you move around the board, so sometimes you’ll deliberately take a longer route as you may want gems more than you want coins. Most of the actions are a straightforward combination of collecting or exchanging swords, hearts, gems and money. The theme works well enough here: swords will defeat the dragon to earn hearts; gems go to the trader for money etc. There are some nice magic items to spice things up a little, as well as a small amount of dice rolling (which you can mitigate). Once a player has enough hearts and coins they return to the castle to claim the heart of their chosen royal (or, in other words, win the game). However, if you want a little extra game at the end you can spice it up a little: there are nine doors in the castle, and once you’ve returned you open one to see if the prince and princess are inside. If not, there will be an extra item depicted that you have to give up to try another door – otherwise you have to wait another turn to try again. It’s simply push your luck: do you get all eight extra items on the doors, guaranteeing victory if you’re first back; or go for broken with less and hope you get lucky? The writer: While I love Touria’s main mechanism (which reminds me a little of what we did with Empire Engine), I feel the finished article falls between several stools. It becomes a little repetitive after only a few plays and the tension of not knowing how other players are doing – combined with being able to hamper them by making certain actions unavailable – isn’t enough to carry it. Which is a shame, as it feels as if the mechanism deserves more. The thinker: This is not a game for me. It works and is well thought out, but the clever tower mechanism is overwhelmed by the light euro they’ve placed over the top of it. I’d like to see a game more focused on what you are leaving available to your opponents, forcing that extra level of tactical choice. Instead it is a very friendly game, meaning you can usually get what you need – even if it is sub-optimally. Hopefully the mechanism will be used again elsewhere, in a game more suited to myself – it would work well in a good, thinky abstract. The trasher: I quite enjoyed Touria as a two-player experience, as it feels as if you can directly affect your opponent (especially if they pick up a few black gems, as you need to get rid of them to win and only one action lets you do this) and the game is finished in under an hour. But more players simply adds more time and less control, meaning your scheming can be ruined by other players. I’d play this one, but it’s not one I’d reach for off the shelf. The dabbler: I enjoy this one for the story it tells. The rulebook introduces the characters and helps tell the story, while the art and theme come through really strongly in play. All the actions make sense thematically and the components are bright and colourful, while the hidden information definitely helps bring tension – especially when playing with younger players, or those happy to add a little role-playing silliness to proceeding. A really solid family game, especially if you have children who love a fairy tale fantasy setting. It’s unfortunate people criticise the game for it’s ending. It isn’t pure luck – it’s push your luck – and you don’t even have to play that way, as the variant in the rulebook makes it a straight race to get what you need (removing the need to randomly open doors at then end). People need to read the rules properly. Beyond this, criticisms seem to centre on what I’ve said above: a clever gamery mechanism seems to have found itself in what is, otherwise, largely a children’s game. But the clever mechanism actually gets in the way of this too, as the theme an actions could go way lower than 10-year-olds if you take away the complexity the towers bring. In fact, I would recommend this for children as young as five if they’ll like the theme – but I’d suggest playing it more as a co-op to get them used to how everything works. In this way you can make the game tell a story that will always have a happy ending, but be different each time. The kids can move the towers, choose where to go, and collectively get what’s needed to win. Then, when they get a little older, you can introduce them to the game proper. I think it has the charm to pull this off. Touria is nearly so many things, but in the end is a family game with a little too much tactical complexity for children – and not quite enough in the action selection to appeal to gamers. But for the right family this will be a real winner, especially if the theme and an element of roleplaying appeals. * I would like to thank Huch! & Friends for providing a copy of the game for review.